Home Products Solac Wax Heater 2 Tub White W "Depil Center"
Solac Wax Heater 2 Tub White W "Depil Center"
Total body: achieve smoother, more efficient hair removal for the whole body. can be used on both face and body hair. 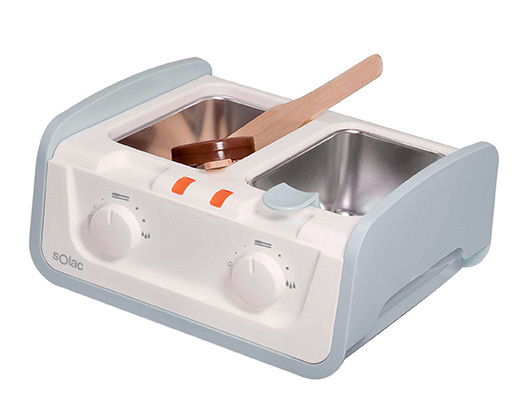 Double wax heaters: two separate chambers for warming and filtering the wax. each chamber has an independent thermostat and on/off light. Filter for used wax: allows it to be re-used, meaning you save money on wax. Compact design that is easy to store. Protective lid to avoid dust build-up. We recommend using solac professional chocolate wax which has regenerative properties. can be used with any wax on the market. Free gift: two wooden spatulas.